Saturday night, while most in America were watching the LSU and Alabama college football game, the real action was taking place in the opening bout of a Telefutura televised card from The Phoenix Club in Anaheim, California. Every fight fan would cherish the lightweight spectacle between Irishman Jamie “The Nuisance” Kavanagh (12-0-1) and rugged Ramon Valadez (11-3-0). Kavanagh entered the bout as the favorite, although you could never count out the Abel Sanchez trained fighter Valadez. Kavanagh, who trains out of the Wildcard Gym in Hollywood, has been a highly touted prospect and a public relations godsend. “The Nuisance” sells himself; a handsome, fan-friendly, Spanish speaking prizefighter who is based out of California. It does not take a genius to see the possible upside of this kid. The first round set the precedent for the entire rest of the fight. Kavanagh came out aggressively pumping his jab while ushering the pace, until getting caught off balance with a perfectly timed left hook from Valadez. Kavangh immediately came back to land a left of his own in what seemed an impossible round to judge. 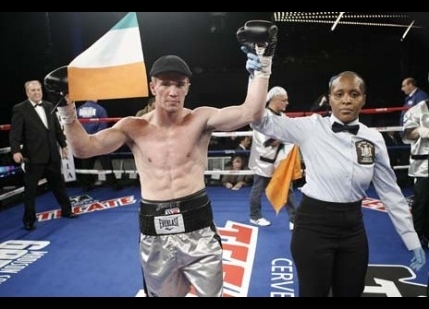 Kavanagh was the busier fighter in the second round putting together nice combinations and clearly winning the round. If the calendar year were to end today, round three of this battle would, without a doubt, be my choice for “Round of The Year”. The first minute of the round was relatively quiet until Valadez connected with a short left uppercut that had Kavanagh in serious trouble. Instead of retreating a looking for an opening to hold, Kavanagh began to move and counter until he landed a straight right that sent Valadez to the ropes, where he then proceeded to land at will. The assault was then rudely interrupted by overzealous referee, Tom Taylor, who looked lost for most of the fight. The pendulum again decided to swing in Valadez’s favor as he landed a flush right hand that had stung Kavanagh, though the round ended in violent exchanges. Rounds like these are what make the sweet science the most majestic of all other major sports. Kavanagh would go on to win a wide unanimous decision in a fight that was actually closer than the cards would go on to say. Some pundits have stated that Kavanagh brings his left hand too low after his jab, or fights when he should hold or…..who cares?! These problems are easily corrected, but the way Jamie Kavanagh responds after getting tagged is un-teachable. Sometimes a fighter is born and not made, which is exactly what makes Kavanagh so polarizing. I do not know what the future holds for young Kavanagh, but I have officially boarded that roller coaster; I am a fan. More Jamie Kavanagh please! P.S. I always write to music. So to keep it Irish, I started with U2. After watching the bout again and Kavanagh’s style, I went with The Dropkick Murphy’s instead. Just saying. This entry was posted in Boxing/Sports on November 6, 2012 by theboxingembassy.